#7 3/4 window envelopes with security tint inside are used in business and have many uses. This less used size can help draw attention to your mail piece. The window measures 1 1/8" x 4 1/2" and is 7/8" from the left and 1/2" from the bottom of the envelope. 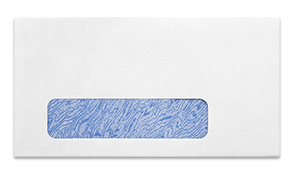 For a small additional charge we can add latex gum to these envelopes to make them self seal.